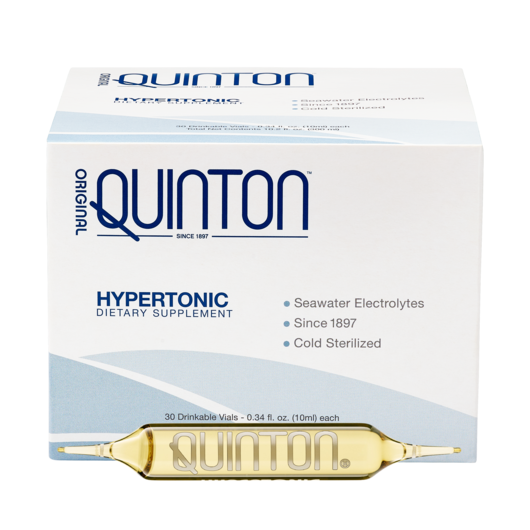 Quinton Hypertonic® is 100% seawater and is typically used by individuals looking for an immediate revitalizing effect that can support exertion from major physical or mental tasks. Quinton Hypertonic® offers the minerals needed to help cell renewal and contribute to normal muscle and digestive functions. Original Quinton Hypertonic® is a nutrient-rich, raw marine fluid harvested from the depths of plankton-rich ocean blooms and cold-sterilized to retain its healing properties. Original Quinton Hypertonic® is formulated at a hypertonic concentration higher than that of our plasma and can readily move into cells. It can help lift the body up, increasing energy and supporting protein synthesis, adrenal function, cellular division, remineralization, and bone formation. Quinton Hypertonic‘s package offers 30 glass drinkable ampoules 0.34 fl. oz. (10 ml) each. Each 10 ml ampoule of Original Quinton Hypertonic® delivers 3.3% bioavailable, bacteriologically pure, naturally sterile minerals and trace elements. Because it undergoes only cold sterilization, all the marine-rich complexes in Original Quinton Hypertonic® retain their original form and potency. I love the quinton seawater! It was recommended to me by a good friend with a very busy life style. I’ve been taking it for 3 months now and I love the way it makes me feel. I used to be tired all day long and not being able to do much after work. But not anymore! I truly encourage every one of you to give it a try. You will not regret it!